Chancel Furniture, or church pulpit furniture, encompasses a large collection of sanctuary furniture pieces. All of which serve a specific purpose within the church service. 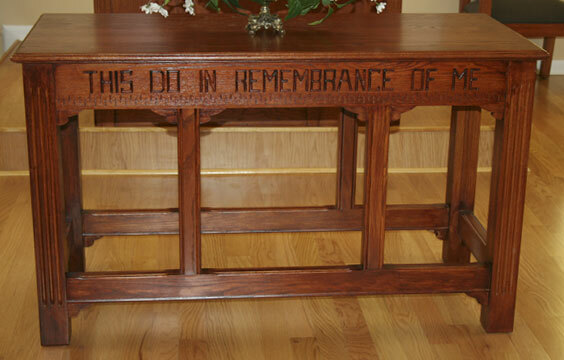 Whether your church service includes the use of a communion table, collection table, water table or all the above, we can manufacture them. 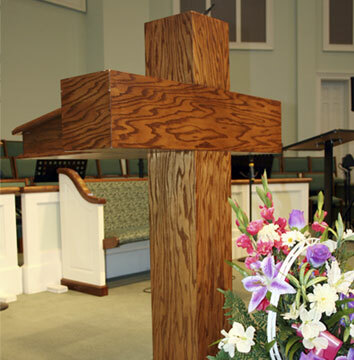 All our pulpit furniture is manufactured after the order is placed, especially for you. Therefore, we can customize it to best serve your needs. Whether you need it smaller, larger, shorter or taller, we can accommodate your special requests. The pulpit is the central focal point of the sanctuary. It is probably the only piece of furniture in the church that everyone will see. It should complement the church’s architecture. It should be proportionate to the sanctuary and stage area. And, it should be a comfortable platform from which to deliver the sermon. 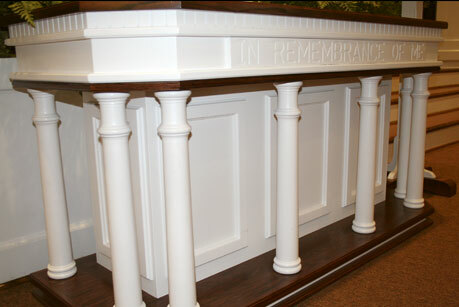 The communion table is usually selected to match or complement the style of the pulpit. King Church Furniture has a great selection of both open and enclosed tables. Whatever your needs, we have or can design the pulpit and communion table to meet them. Please contact us for a catalog to see our complete selection. Please feel free to call us at 1-800-895-5464 if you have any questions or comments, or if you would like a free catalog. Or complete the form below and we will be in touch. 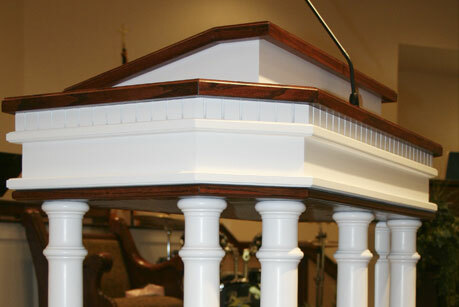 Please complete this form to request a catalog or inquire about custom church pulpit furniture. King Church Furniture, Inc. has proudly supplied thousands of churches throughout the United States and abroad with church furnishings since 1946. Our longevity in business speaks volumes about our service, integrity and the quality of furniture we have been producing for more than sixty years. As a family owned business, we are steeped in the tradition of providing exceptional church furniture customized to your specific needs.